In the boys race Mt. Ararat prevailed with 16 points followed by Brunswick with 39, Morse with 91 and Skowhegan with 94. The Eagles also took the win on the girls side collecting 19 points to the 45 put up by Brunswick. Skowhegan's five runners collected 79 points. Neither Lawrence, Nokomis, nor Morse had five runners in the race. With Mt. Ararat having dominated the earlier meets this season the Eagles lead runners took a different approach to this race. Katherine Leckbee and Lisandro Berry-Gaviria who torched virtually the same girls and boys fields last week held something back. Leckbee ran three abreast with Mt. Ararat's freshman duo of Camila Ciembroniewicz and Karlie Leighton. Ciembroniewicz and Leighton would have been expected to finish 2nd and 3rd based on last weeks results. Leckbee held the pace with the two first years for two thirds of the race and even then only eased ahead to best Ciembroniewicz by ten seconds and Leighton by 14. Similarly Berry-Gaviria held back. Content to let the home town number 1 runner, Josiah Webber of Lawrence, battle with Brunswick's first year Aiden Simmons for the lead a until the second loop of the course, Berry Gaviria stayed in the middle of the chase pack for much of the first loop. First year Webber ended the race first for Lawrence and 15th overall with a time of 19:52. Simmons finished 4th for Brunswick and 9th overall. The course starts behind Lawrence High School adjacent to the track. After a short run across a field it narrows to a woods trail for about 100 meters before opening back up on to some auxiliary playing fields for two big loops before returning via the same woods path to the finish. The bulk of the loops follow the perimeter of a number of playing fields periodically running over hard packed gravel dirt roads and parking lots. About 600 meters of the loop traces a horseshoe through a rolling meadow filled with blooming asters and runs over a somewhat uneven mowed trail just within earshot of I-95. Some runner's Garmins had the distance close to 3.2K. Mt. Ararat took the top four spots in the boys race. Berry-Gaviria was followed by Lucas Bergeron, Devin Hoskins, and Nate Cohen. Cohen (18:26.10) came in just off Hoskins's heels (18:26.00), possibly the result of Berry-Gaviria running in the pack for so long. Closing the scoring for Mt. Ararat was Andrew Chamberland who finished 6th. Brunswick was led by the 5th place finish of Cam Ashby with Tyler Patterson, Andrew Chingos, Aiden Simmons, and Daniel Lyons finishing 7th through 10th. Morse's top finisher was Ben Brewer at 13th; other scorers for the Shipbuilders were Liam Scanlon, Caleb Avery, Ben WIllertz and Ben Hinds. 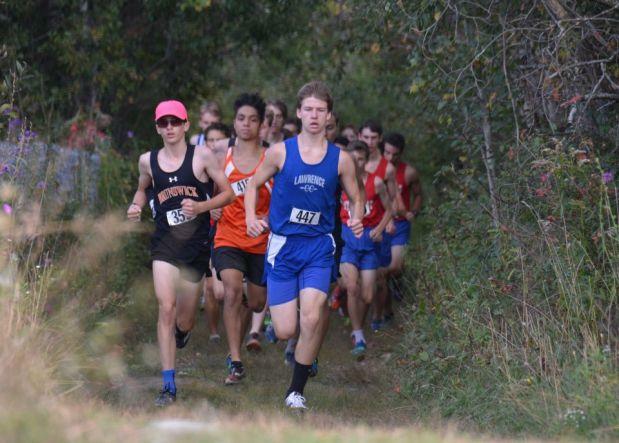 Skowhegan scorers were led by Jake Perkins with a new PR of 19:55; other Skowhegan scorers were Grant Garcia, Lucas Smart, Logan Malek and Jakob Vanvliet. Daniel Gronzcy took 14th place as the first Nokomis runner to finish. For the girls the trio of Mt. Ararat finishers were followed by Micaela Ashby and Isabella Pols of Brunswick with Morse's Jenny Wilbraham taking the 6th spot. 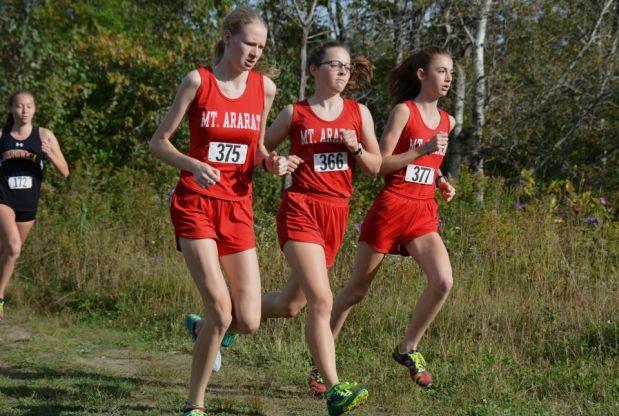 Mt Ararat's other two scorers were Katie Lynch (7th) and Anna Pederson (8th). Joining Ashby and Pols to score for Brunswick were Emily Coffin (14th), Adelin Dolley (18th), and Kathleen Koval (22nd). Skowhegan, a team that earlier in the season was not able to figure in team scoring due to roster issues, had five runners cross the line. Leading Skowhegan was Haley Bellrose who finished 11th. Other scorers wearing the orange of Skowhegan were Davon Perkins, Carey Lee, Madison Carter and Sarah Bonnett. Morse which beat Brunswick just last week, did not have the numbers to figure in team scoring as only three Shipbuilders started the race. Nokomis and Lawrence also did not figure in team scoring but were led by Emily Eastman, and Selam Heinrich.